Earlier today, at a local pawn shop, I purchased Teenage Mutant Ninja Turtles for the Nintendo Entertainment System. Much to my dismay, the game would not work. I even cleaned the connectors four times. This is a very rare problem. Only twice have I seen 100% dead video game cartridges. The other was Kirby’s Star Stacker for the GameBoy. Instead of chucking the game to the moon, I channeled my frustration into something positive. Using Photoshop, I transformed the shell of a Ninja Turtles cartridge into The Wizard for the NES. 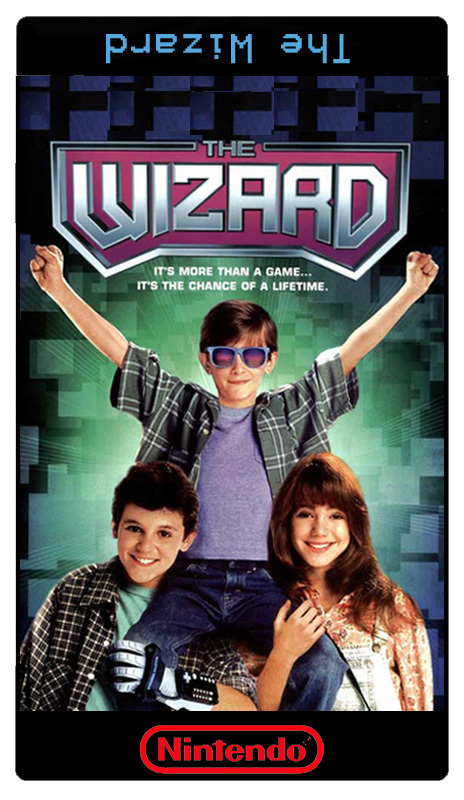 Every retro video game fan should know what the deal is with this movie. If not, click here. Below is the label if anyone wants to undertake a similar endeavor. Either print it onto a real label for sticking or follow my cheapo example by covering it with clear packing tape. Now your broken or unwanted NES cartridges can become faux pieces of gaming history. Games are art if you look at them like movies. If you play games even remotely as much as I do, you know full well that not everyone approves of your hobby. I’m not one to judge. They may even be right in some instances. The problem lies with how the media portrays games. Every day, we are bombarded by news articles about criminals who are “influenced” by the video games that they play. These isolated incidents don’t help matters in the least. This article focuses on a different angle. “Video game” is an outdated and improper name. It has a somewhat negative connotation that goes back to the arcade days. I dare you to find someone who doesn’t consider movies or novels art, but video games are another story. The classic type of game such as a Pac-Man, is what I would call the electronic entertainment equivalent of an American Pie. It doesn’t need to have a cultural significance, other than being fun. It’s more of a way to take your mind off your problems. With the advent of better hardware comes something that throws new curveballs into the argument. Games like Mass Effect and Catherine surely have plots that are as good as, if not better than most movies. Being involved in a large than life adventure with your own personal choices surely has cultural and philosophical significance. The problem is that most people today haven’t seen or played games like this. You’d be hard pressed to get a news reporter to sit down and play Mass Effect all the way through, let alone watch someone else do it for only an hour. I hope that one day, as games become more mainstream, this will not be the case. Movies and rock ’n’ roll all had to go through these issues to become officially recognized as art. I hope that my hobby will one day share the same success.